'Bill! Bill! Wake up, Bill, I can hear something on deck. Bill!' Whispered Lyn urgently as she nudged her partner. 'Umm, yes love, ' murmured Bill snuggling up to her. 'Wake up! There's something scurrying around on deck.’ She urged emphasising her plea with a sharp nudge from her elbow. 'What!' where, where!' yelped Bill as he almost fell out of he bunk. ‘Ah! me head!’ momentarily forgetting where he was, Bill had banged his head on one of the low cabin beams. 'Humph! Well that should have scared it off whatever it was.' replied Lyn, bouncing as Bill sat back heavily on the bunk rubbing his bald patch. 'Don't just sit there go have a look on deck make sure what ever it was has gone,' she urged. 'Oh bloody hell, where's the torch?' complained Bill as he fumbled in the dark. 'It should be by the chart table. Unless you've moved it,' said Lyn. 'Yeaow!’ yelped Bill, stubbing his toe on the companionway steps as he groped his way to the cockpit. Finding the torch he tried to see what might be on the deck by shining it through the portholes but all he could see was the reflection of the torch light and the vague reflection of a middle-aged tousled face peering back at him. 'God its cold,' he muttered to himself, shivering in his fleecy pyjamas as he flashed the torch around looking for a coat. Stumbling back into the cabin the torch flashed in Lyn's eyes as he searched. 'You're supposed to be looking outside not in here,' she murmured pulling the duvet over her head. Muttering something incomprehensible Bill pulled on an old coat that felt as though it had been in a fridge. He shivered his way back to the cockpit and slowly slid open the wooden hatch. Shining the torch on the side-deck, he gingerly put one bare foot outside. As the sole of his foot touched the icy deck, another little bit of romance cooled along with the foot. The novelty of their relationship had started to wear off shortly after they entered the French canal system at Calais in Lyn’s beloved wooden sailing cruiser Piffi. Lyn being the sailor of the two was perhaps a little too impatient with bill’s boat handling skills. If only the weather had been kinder, the November drizzle and cold and the grey landscape of Normandy were not conducive to a romantic journey. There were no golden sands or umbrella skies just the grey green misty flat fields and dripping canal banks. Lyn and bill had been together for a couple of years now, both were divorcees who had met and immediately formed a repartee then moved in together. It was while their romance was still on the boil that the idea had bubbled up of taking early retirement. Like the Owl and the Pussycat, they had decided sail away in Lyn’s beautiful pea green boat. They didn’t know if bong trees grew in Turkey but that was where Bill’s daughter lived with her Turkish husband. Therefore, the plan was head in that direction where hopefully, the low cost of living would allow them to manage on Bill’s small pension and the interest on their savings. Initially, they had planned to sail round the coast and in into the Mediterranean through the straits of Gibraltar. However, sorting out their various affairs had dragged on into the autumn. Not wanting to risk a stormy Biscay crossing, they had decided to take the easy route through the French canals from Calais to Marseilles. This suited Bill, it seemed much more like his sort of boating. Lyn would have preferred to keep the mast of her beloved Piffi erect, but the plan did seem to be the obvious one. 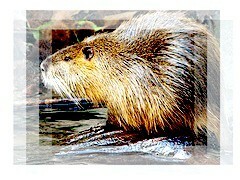 Some of their enthusiasm had been put to the test at one of the locks on the St. Quentin canal when, what looked like a drowned terrier floating in the muddy leaf strewn water turned out to be a Coypu, a large rat like creature. The explanation that they were gentle, shy, herbivores was no consolation to Lyn who had a dread of rodents. The following day they had set off bright and early hoping to arrive at Maxilli the last lock before the river Saône, where according to their Michelin Local map, there was a good halte fluviale. They were doing quite well until a slow moving Peniche held them up. It seemed to take forever to get through each lock and it was impossible to overtake in the narrow canal. Eventually, when they conceded that they that they would not reach Maxilli in daylight they started looking for somewhere suitable to moor. By the time they noticed the derelict quay it was almost dark. After a pleasant evening meal in the warmly lit cocoon of their cabin, they had retired early. They were lulled to sleep by the pattering of condensation from the surrounding trees dripping onto the decks and the plop of fish in the canal outside the hull. Now in the early hours Bill’s peace having been broken he reluctantly poked his head outside. 'Cripes that's cold!' quickly retrieving the foot he lent out and shone the torch around as much of the deck as he could see. 'Bugger all out there.' he tried to convince him self. Then he shone the torch on the canal bank. 'Oh my god!' he gasped, glowing back at him in the torch light were a dozen pairs of green eyes. Little bright staring pinpricks of lime green. 'Hell!' he gasped, slamming the hatch. 'Air vents! God, are any air vents open!' Rushing around now, the cold forgotten he stated checking and screwing down the small air vents in the fore cabin and in the cabin roof above the galley. Startled by the sudden flurry of activity, Lyn poked her head out from below the duvet. 'What is it, what's up!' she asked sensing Bills panic. 'Oh my goodness put the lights on,' whimpered Lyn pulling her legs up and wrapping the duet around her. Like children afraid to look under the bed, they huddled in the light of the pressure lamp. Bill lit the paraffin heater but with all the air vents closed, it soon became too stuffy in the sphere of hissing light. The rest of the night was spent huddled together listening to every creek and plop imagining their shrinking cabin besieged by swarms of rats like a scene by Hitchcock. Even the corners of the cabin took on a sinister flickering shadowiness. Eventually after hours of nightmarish dozing, the dawn struggled to penetrate to dripping grey-green gloom along the canal. Clearing a peephole in a misted porthole Bill peered out hoping the nocturnal visitors had dispersed. ‘What is it?’ asked she asked nervously. ‘I think you should have a look at the canal bank,’ he replied. There, among the pile of fly-tipped rubbish on the bank side was a collection of cats-eye reflectors of the type used to mark roadsides. They still glittered in the dull morning light but not with the intensity that they had in the light of Bill’s torch. When they arrived a Maxilli a couple of hours later a perplexed éclusier shrugged his shoulders and rolled his eyes skywards at the sight of two elderly Anglais laughing and punching each other.